As promised in late October, I wanted to put together all the Table of Content for every issue of EON published so far. Well it's done! We can now go back to this list and see the full content available to us thanks to the hard work for the folks at MMMPublishing. You can easily see if you need to order a particular issue you've missed, because of a specific article you'd like to consult. 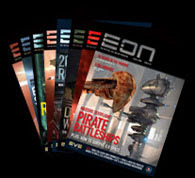 If you decide to order a specific issue, or a full year subscription, head over the to the EON store to do so! The full list can be accessed using the 'eon toc' tag. If instead you're interested in a particular issue simply select from the list below. As for future issues, I'll keep updating this post as I receive new issues. Please let me know if you spot any errors that may have slipped in. While we're on the subject of EON, let me ask you this: Which is your favorite issue so far? Please fill in the poll and use the comments to let me know why.